Thank you for visiting the official website for the Northwest Fiero Festival! Don't Miss our 20th Anniversery Show! 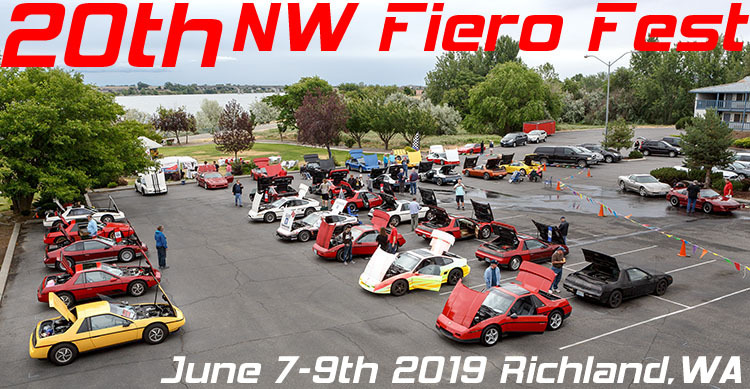 The organizing committee for the NW Fiero Fest want to extend a big THANK YOU to all who attended the 2018 show! We had 29 beautiful Fieros on display from all over the Northwest. For 2019 we will return to Richland in June after last year's cooler weather! Please tell all of your Fiero friends and plan to attend in 2018. Lets see if we can have 40 cars for our 20th year! We will be bringing back an event T-Shirt this as well as all of your favorite activities during the weekend. This year's show will be June 7th-June 9th 2019. -Friday Night Lights custom lighting competition after dark. -Pizza delivery to the park on Saturday for lunch. -Slow drags moved to an earlier time. Please see the What's New page for all of the details! Registration is now open and the early registration discount of $20 is in effect until May 13th. We will be carrying over the classifications and awards from the past few years so please be sure to look at the Car Classes page as well as the Judging Info so you can be fully prepared in June! Questions, problems, or suggestions? Email the Webmaster.